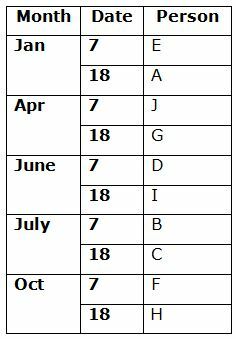 Ten persons A, B, C, D, E, F, G, H, I and J are born in five different months viz., January, April, June, July and October of the same year. They all are born in two different dates 7th and 18th of the given months. No two persons are born in the same date of the same month. C is not the youngest person. B was born immediately after I. Only two persons are born between B and H. Both I and B are do not born in the same month. 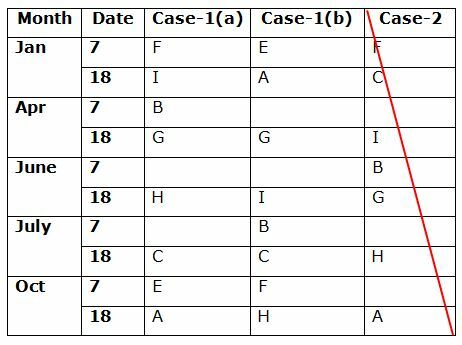 As many persons born before A is same as the persons born after F. More than three persons are born between B and E. J is elder than D and none of them born in the months which has odd number of days. Three persons are born between C and G, who was born in even numbered date in the month which has 30 days. F does not born in even numbered date. 1. 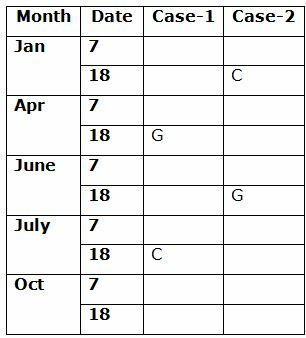 D was born in which of the following dates? Three persons are born between C and G, who was born in even numbered date in the month which has 30 days. C is not the youngest person. B was born immediately after I. Only two persons are born between B and H. Both I and B do not born in the same month. As many persons born before A is same as the persons born after F. F does not born in even numbered date. More than three persons are born between B and E.
J is elder than D and none of them born in the months which has odd number of days. 2. How many persons are born between J and C? 3. Who among the following persons is the eldest? Directions (6-10): Each of the questions below consists of a question and two statements numbered I, and II given below it. You have to decide whether the data provided in the statements are sufficient to answer the question. Read all the statements and answer the following questions. Six persons K, M, P, S, T and V are sitting in a circular table. Who among them sits second to the left of M? I. T sits second to the right of S. Only one person sits between K and P, who is an immediate neighbour of S.
II. Two persons are sitting between K and S. V sits second to the right of P, who does not sit adjacent to K. T does not face V.
How many persons are sitting between P and R in the row of 43 students facing north? I. R is 18th from the right end. Only four persons are sitting between R and A, who sits left of R.
II. 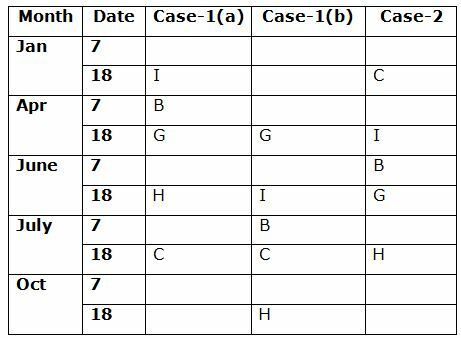 Only four persons are sitting between P and B, who sits immediate right of A. P is not an immediate neighbour of R.
By combining the both statements, there are eight persons are sitting between P and R.
In which of the months does Arun visit Mumbai? I. Arun’s sister correctly remembers that, Arun visits Mumbai in one of the months after June and before October. II. Arun’s father correctly remembers that, Arun visits Mumbai in one of the months has odd number of days. By combining both statements, we does not conclude the month which Arun visits Mumbai. Who is the uncle of E? I. B is the mother of A. C is the only daughter of A’s father D. E is the daughter of F, who is the spouse of C.
II. 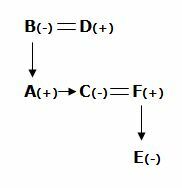 D is the father-in-law of F. E is the niece of A. 10. Among T, K, L, M, N and R are arranged according to their weight. Which of the following person is the lightest? I. M is heavier than only two persons. R is lighter than only one person. II. K is heavier than L but lighter than T. L is not the lightest. C is not the youngest person. B was born immediately after I. Only two persons are born between B and H. Both I and B are donot born in the same month. 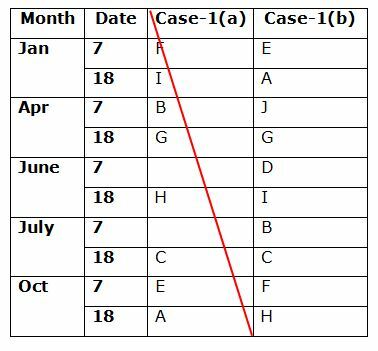 As many persons born before A is same as the persons born after F. More than three persons are born between B and E. J is elder than D and none of them born in the months which has odd number of days. Three persons are born between C and G, who was born in even numbered date in the month which has 30 days. F does not born in even numbered date. 1) D was born in which of the following dates? 2) How many persons are born between J and C? 3) Who among the following persons is the eldest? 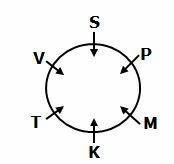 6) Six persons K, M, P, S, T and V are sitting in a circular table. Who among them sits second to the left of M? 7) How many persons are sitting between P and R in the row of 43 students facing north? 8) In which of the months does Arun visit Mumbai? 9) Who is the uncle of E? 10) Among T, K, L, M, N and R are arranged according to their weight. Which of the following person is the lightest? I. M is heavier than only two persons. R is lighter than only one person. II. K is heavier than L but lighter than T. L is not the lightest.